Download THE STAR TRAILS COMPENDIUM for FREE and discover the details behind the complex setting of the Star Trails Tetralogy! 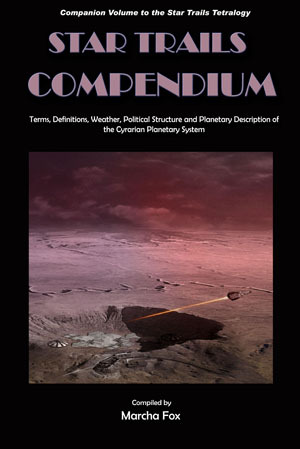 A glossary of terms and definitions as well as a description of the Cyrarian star system, political structure, and unique planetary configuration which yields extreme weather patterns, are all included. In addition, you’ll find a special bonus section for educators who use The Star Trails Tetralogy as part of their reading list. Suggested lesson plan and discussion ideas, based on the scientific principles included in the stories, can be used for extra credit assignments. Great for home schoolers! Thyron is one of those characters you either love or hate. Most fans loved him and his poetic speech enough they begged for more about this witty flora peda telepathis, Sapphira’s species of telepathic walking plant. Find out the true relationship between Thyron and his cannibalistic pygmy traveling companions, as well as what started the natives’ devious practices and cultural traditions. Get inside a vegemal’s complex mind and discover how he stores his knowledge and experiences for the next generation. If you’ve read A Dark of Endless Days, then you know that Thyron and Aggie were confiscated with their ship, the Cerulean Nimrod, and taken to Area 51. While there, NASA scientist, Gabriel Greenley, is charged to study this new lifeform. As a botanist, he’s intrigued by this fascinating extraterrestrial species and wants to learn everything about him. But what will that entail? Just what does he intend to do with that cutting device? Will Thyron’s newly discovered psychic powers be enough to save him? Is Greenley friend or foe? Or does the astrobiologist have a few secrets of his own? And what about Aggie, who’s been disassembled so her technologies can be reverse engineered?